Donated By: Sturm, Ruger & Co. Smoothly contoured, comfortable grip features natural pointing grip angle with replaceable, checkered grip panels for a non-slip hold. 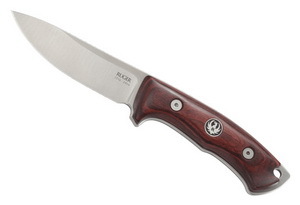 The Ruger Centennial knife from CRKT produced in honor of William B. Ruger's 100th birthday, is a stainless steel full tang fixed blade that is 100% hand crafted in the U.S.A. Designed by award winning knife maker Bill Harsey, this knife incorporates a rugged full tang and handcrafted laminate wood handles with embedded Ruger eagle medallions affixed with stainless steel grip screws. The handles are contoured for positive grip even in wet conditions. Harsey gave the Centennial knife a sturdy, long swept, semi-drop point satin finish blade; this blade design is field proven for cutting efficiency. A 154CM blade steel was selected for excellent, long lasting edge retention. 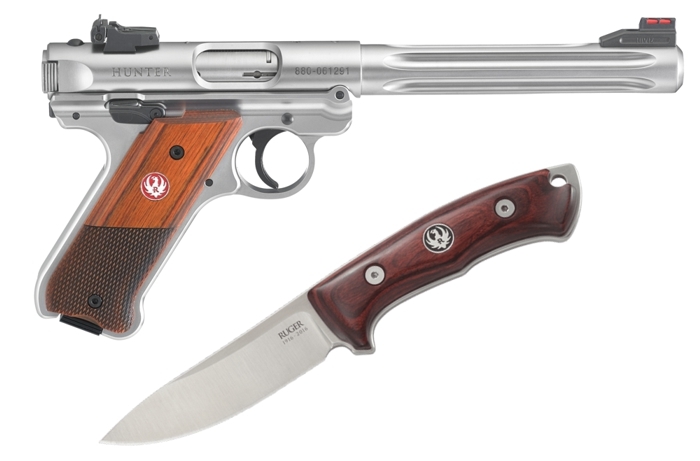 The design, shape, deep bevel grind and finish speaks to rugged, reliable Ruger. About Sturm, Ruger & Co. But this fledgling company was guided by several well-thought-out concepts, not the least of which was founder William B. Ruger’s intent to build each product “to a standard so I would want one even if it was made by our competitors.” This fundamental concept, this deceptively simple touchstone of the underlying principles of innovation, quality and value, has proved so compelling that over 60 years later there is no question which company is preeminent in the American firearms industry. Ruger’s rise to its present well-earned position has made it a respected company on the New York Stock Exchange since 1990. Ruger produces millions of firearms each year for hunting, target shooting, collecting, self-defense, law enforcement, and government agencies.